Flies back to the starting position and exhale at the end of the movement. During exercise, the more your chest will be inclined, the more you will work the lower part of the chest. On the other hand, the more your chest will be straight, the more you will work your triceps. 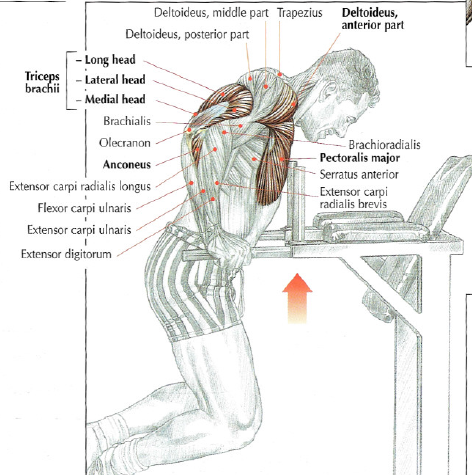 This exercise is excellent to stretch the pectoralis major and relax shoulder girdle . If you’re a beginner and have difficulty doing this exercise, you can use the machine dips to have more power. Sets of 10 to 20 reps give excellent results. For athletes who are used to do this exercise, it’s possible to increase the difficutly with a weight attached to a belt or between the legs to have more power and volume. Attention : In all cases, it’s necessary to do dips with caution to not traumatize shoulder’s joints.